Eventually I emerged from the tree, but I continued to spend time with the tune as my silent retreat unfolded. Turned out I had several versions on my iPod but only one with vocals. I was not disappointed. and thank you for being such a vital part of my path into jazz. One ~> Mosaic Woman finds a card I addressed in August. The friend was the 21st person to make a donation to my campaign to feed the hungry. I remember offering something to whoever was the 21st. What was it? Last night I chose scraps of glass, 21 pieces of redemption. I am imagining something new. An improvisation. A gift to a friend, who has been very patient. Two ~> in my studio window hangs a mandala. Was it not supposed to go to Cleveland with me as a gift to friends who gave me a room with quite the view. Three ~> a baseball card sits in my closet. 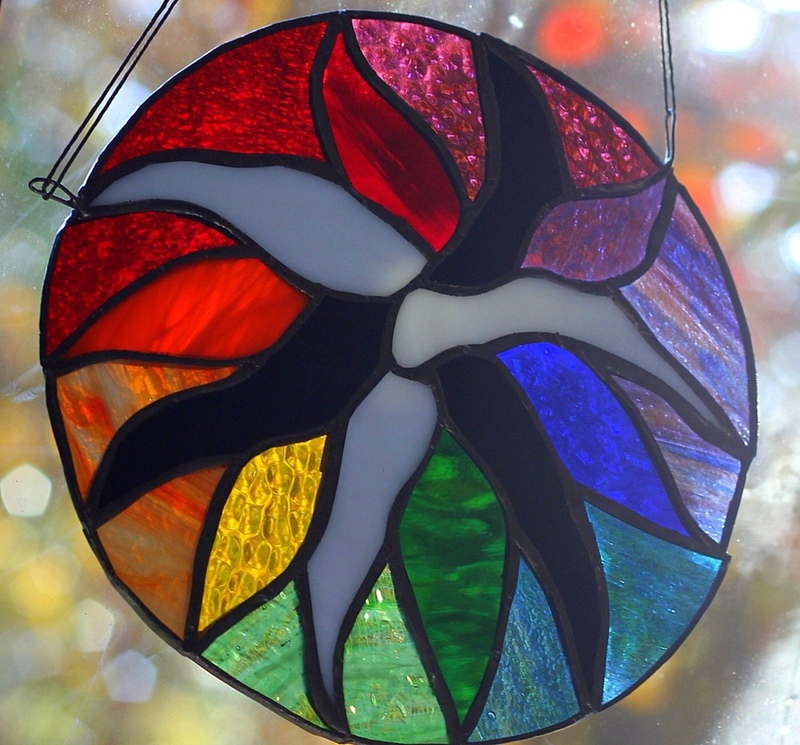 Had I not planned to send it to a friend, who not only commissions stained glass, but also sends me amazing photos of them in their new home. Four ~> a card rests on my drafting table. It is for a friend, who has shown me that she truly believes my cards are drawn with hope for healing by one commission after another. My friend has been in my prayers, and yes the card is a daily reminder to pray for her, but it is time to mail it. Time to make the gifts become a reality. My students have many a river to cross and on top of that my PA Dutch grammar can baffle the average student. With that said, I can write tests that all will fail or tests on the same material, which all the same students will get A's. Too often us teachers see tests as indicators only on what students have learned. They are also an indicator on how the students were taught. If a question baffles many, then I need to try to teach the material differently or as a friend told me recently ~> ask the question differently. My students would not be in my classroom if their only problem was test taking. I see this as my goal - to show them that a classroom can be a place that is not traumatic. So why fail them and have them leave feeling the same way about school. The other day in my bio class, I joined them at our communal table. I sat down at their level. I looked at them and said, "You have had a marvelous quarter. You have completed everything I have asked of you in and outside this room." It was the truth, however, I couldn't have said it to all my chemistry students. "So now I need to see what you have learned in the past nine weeks. I really don't care if you have learned everything. I do care that you allow me to see what you have learned so I know how well I have taught you. You all have earned a fine grade from me. Don't fear this test." Then we reviewed. The cool thing is this ~> when they are proud of themselves, I can be proud of myself. Today my horticulture students were given a boatload of flowers and told to create something beautiful. They passed.